I love i. Question! Having only a bare minimum of physical science knowledge (hate physics, love chemistry), is that graph you have of the real voltage what you would get off of a voltmeter? That is, does the voltmeter only measure the real voltage? If so, that is fascinating. I know that properly-built circuits can do quite interesting things to electricity, but I didn’t realize that it could actually cut out the imaginary part of the voltage. Also, I had heard that with a properly set up circuit, you can get a resistor with imaginary resistance. Is this true? If so, what does this *do* when it interacts with current with real voltage? Or does the circuit setup only allow imaginary voltage differences in that area? I clearly have no idea what I’m talking about, this is why I ask! My favorite teacher in high school was my math teacher. He would go on a rant about ‘i’ and the term imaginary number. There is No Such Thing as a Real number he would say. Go out in the back yard and dig up a three for me. Go to the store and buy a bag of three’s. You can’t do it. ‘i’ is as REAL as the number 3 and don’t let anyone tell you otherwise. If I haven’t made my point, he ‘hated’ the terms REAL and IMAGINARY. For me, I just think of ‘i’ as being a mechanism for thinking two dimensionally rather than one. If you get an AC voltmeter, it will read constant for AC current – no variation in the force behind the current. If you’re using a DC voltmeter, you’ll see it swing back and forth, because it’s only measuring the component of the force in one dimension, when it’s actually a two-dimensional property. That’s the trick to it: i isn’t imaginary. Complex numbers are as “real” as what we call real numbers. Complex numbers are two dimensional. You aren’t “cutting out” the imaginary part of voltage; you’re using an instrument which measures the *projection* of a two-dimensional value onto one-dimension. One little quibble, though – the voltage at the wall socket in North America is about 110V rms, so the peak voltage (assuming a perfect sinusoid) is sqrt(2)*110, or about 156V. Also, when you say you would still get a shock if you grabbed the wires when the voltage is zero, I disagree – assuming you mean you could grab and let go before the (real) voltage increased to a shocking level. The real voltage is what drive real electric current through a resistive circuit (the human body can be considered purely resistive at 60Hz – the capacitive and inductive reactances will be negligible at such a low frequency). And it’s the real current which causes the shock (muscles contracting involuntarily, pain, and even burns at high enough current levels). Yeah, that’s it exactly. Complex numbers are numbers in two dimensions; algebra (and many physical phenomena) require two-dimensional numbers in order to really make sense. It’s been years since I took serious math so forgive me if I’m rusty, but how can i show up in cubic equations of “real” numbers. Doesn’t “cubic” imply a x^3 somewhere? And if so, since the exponent is odd, doesn’t i have to show up bare somewhere in the original equation? I always thought i was a consequence of some quatratic equeations, that is, equations with 2 as the highest exponent. Most of the early efforts to solve cubics were based on doing transformations that allowed you to find a transformation that gave you a quadratic equation which you could solve, and then pass that through the reverse transformation. My understanding is that the inner quadratic used in the solution process can have imaginary roots. I take issue with your electrical and acoustic example. In those examples the imaginary number is used purely as a mathematical abstraction. Yes a very powerful and convenient abstraction, but in classical E+M, there is no such thing as imaginary voltage or current(at least not as a physical quantity). However, a far better example of physical complex numbers would be probability amplitudes from Quantum Mechanics. Of course, you can not actually measure ‘probability amplitudes’, but still it requires complex numbers to be represented. That being said I too love ‘i’. Good math, bad physics. The real power follows the voltage amplitude, so for an ideal resistance we have P = UrmsIrms = Irms^2*R. During 0 passage you aren’t shocked, if you are earthed. That is why it is much easier to let go of an AC than a DC wire at the same voltage magnitude. No, but you can get reactances, that is components with imaginary loads (impedances) Z. Then you need to follow through Mark’s analysis on complex currents, ie currents with magnitude and phase (time delay). Xanthir: As for imaginary resistance, look up “impedance”. The imaginary component of impedance is actually the capacitance/inductance we observe. But all of this only because relevant for the case of varying signals. In a DC world, capacitance and inductance don’t affect your circuit. If the imaginary value of your voltage is zero, the imaginary value of your impedance is ignored. As a BSEE and a guy who digs signals processing, i (or rather j, mwahaha) is definitely my favourite number. Mark, I’m afraid that you’re mistaken when you say “If you grabbed the wire when the voltage is supposedly zero on that graph, you’d still get a shock!”. That’s true in the sense that it’s impossible to grab the wire for a period of time with duration = 0, but there will be a zero-crossing in the current. Exactly when that zero-crossing will take place depends on the complex impedance Z of the load. If the load is purely resistive (real), i.e., Z = R + j0, (in electrical engineering i is called j because the letter “i” already has a meaning- instantaneous current), the current will pass through zero at the same time the voltage does. If the load is purely reactive (imaginary), i.e., Z = 0 ± jX, the current will lag or lead the voltage by π radians, depending on the sign of the imaginary component, so the current zero will take place 1/4 cycle ahead or behind the voltage zero. If the load is complex, i.e., Z = R ± jX. the current will lead or lag the voltage by an angle equal to arctan (X/R). In any case, if the circuit is composed entirely of linear, bidirectional components and the voltage source is a single-phase sine, there will be two current zero-crossings per cycle just as there are two voltage zero-crossings per cycle. BTW, that’s why the DC current rating is often less than the AC current rating for switches. It’s easier to break an AC arc than a DC arc because in an arc conducting AC, the current goes through zero twice per cycle, which means that the arc is extinguished twice per cycle, so you just need to move the contacts apart far enough that it can’t re-ignite on the next half-cycle (the “firing” voltage for an arc gap is generally higher than the voltage drop across the arc once it’s established), while breaking a DC arc requires the contacts to separate enough that the arc’s conduction voltage drop is greater than the voltage available from the source. I taught math (including 7th – 9th grades) for 15 years. I found it helpful when teaching about fractions to introduce the idea of ordered pairs – that 1/3 is just an invented symbol for (1,3), and that fractions were invented so as to have a way to represent the solution of certain equations. That makes it much easier to introduce complex numbers also as an ordered pair with an invented symbol of “i” to distinguish it from the “/” used in fractions. That way it can be presented as just as “real” as fractions are, it is just something that was invented in order to be able to solve certain equations. And in both cases there are “real world” interpretations of them. The real interesting thing I think is that the complex plane makes analytic functions (differentiable at every point) having a lot of nice properties, such as analytic derivatives of all orders. And lets one play around with residues, cuts and conformal mappings when doing integrals. What is complex with real numbers become easy with complex numbers. The easiest way to see that imaginary numbers turn up for higher order equations must be to solve x^n = 1. You get complex roots symmetrically set on the unit circle. If this is interesting depends on if it is the voltage or the current that contracts muscles and makes wires hard to release, and if it is current or voltage that makes the shocking feeling. I believe the voltage that mess with muscles that are made of cells closely related to nervous cells, not the current, and that it is the muscle spasm that gives the shock feeling. OTOH, it is the current that gives tissue damage AFAIK. 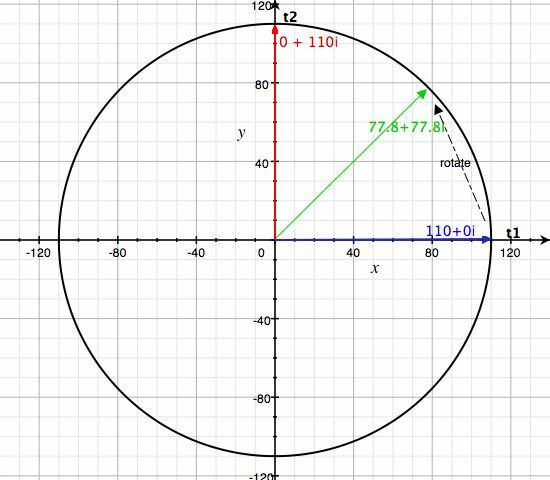 qetzal – Maybe someone else has a better-formed answer for you, but just recall that the angle 2π is equivalent to the angle zero. ex is not a one-to-one function; it’s periodic. I think you’re therefore probably taking an illegal inverse when you use the ln function. It’s just like saying sin-1(sin(0)) = sin-1(sin(2π)), therefore, π = 0. Someone help if you think I’m floundering. Thanks. ThePolynomial: Actually, ex is one-to-one. However, eix is periodic rather than one-to-one, so your argument is still correct. The logarithmic function on the complex numbers is multi-valued, i.e. one argument gives you infinitely many values. So log(re^(ix)) for real r,x gives the values ln(r)+i(x+2nπ), where n takes the value of all integers. which is fine for n+n’=n”. ThePolynomial’s explanation is right: ln is not the right inverse; you need the multivalued log function. Thank you, all. I had gone through Physics2 last year, but I’ve already forgotten it all. >_reading about the bleeding edge of physics). Ok, so I blew it a tad with the electricity example. I should stick to the math, and stay away from the physics :-). The electrical is still a very cool example because the power transmission is still constant, but it’s changing form through the cycle. No, I couldn’t make differential geometry look easy, which is why I’ll never write about it here. But there’s actually an interesting autobiographical story about me and differential equations. Back when I started college, I was an EE major. Unfortunately, I was a *very* bad engineer; the way that an engineer solves problems just *does not work* for my warped brain. So I flunked out of the engineering program. During my last semester in EE, I took diffeqs. At the time, I was pretty much convinced that I was a moron, that I couldn’t do anything right, etc. (Knowing that you’re probably going to get kicked out of school at the end of the year will do that to you.) So I nearly flunked diffeqs; I ended up with a D, and frankly, that was a gift from the prof. I took a year off college, and then came back and started doing CS, which I was very good at. After a year, one of my best friends was signing up to take diffeqs, and I said “hey, I’ll sign up for it with you, just to prove to myself that I can do better than a D”. Anyway, about halfway through the semester, my friend and I had appropriated a classroom to work on homework for diffeqs, and for the discrete math class we were also taking at the same time. It happened that the homework for the discrete class was solving recurrence relations. So we’re scribbling away on the chalkboard trying to do the diffeqs, and I got really frustrated, and said “let’s switch to the discrete”. So we start working on the discrete – and I’m just tearing through these recurrence relations. And after I explain to my friend how I did one, she says “Hey, you know what, that’s *exactly* what you needed to do in that diffeq that you couldn’t solve”. I stared at her. And then went back and looked at the diffeqs. It was the same thing. The recurrence relation was a discrete version of the same form of equation as the diffeq. I could do it for the recurrence, but not the diffeq. Until that moment. I think i is my favorite number. It still confuses the heck out of me, though. On the whole electricity thing: I once got the idea of a D&D spellcaster who primarily uses lightning spells and has a penchant for math. In the unlikely event that he bumps into someone who doubts imaginary numbers, he would ask, “Did you know that you can kill a man with an imaginary number?” or something to that effect. The “Geometer” prestige class would probably be a good career move for a character concept like that. Completely silly question: In D&D, you’ve got positive energy (which heals living creatures and harms undead) and negative energy (the reverse, of course)… So, what would imaginary energy do? That’s what you use to power Plane Shift. Great post. I never made the connection that numbers are two-dimensional. I also appreciated the physics commentary, since my AC electricity skills are woefully unpracticed. I have a pedagogical question. The imaginary and complex numbers are normally taught in high school Algebra II and precalculus courses, but I never get the feeling that the students ever have a clue what they are good for. Solving polynomials is one example, but a high school math student thinks solving polynomials is drudge work. Are there other “real world” applications of complex numbers, other than in AC electricity and quantum mechanics? Complex numbers show up all over the place once you start looking. The two-dimensional number plane ends up having a lot of uses. 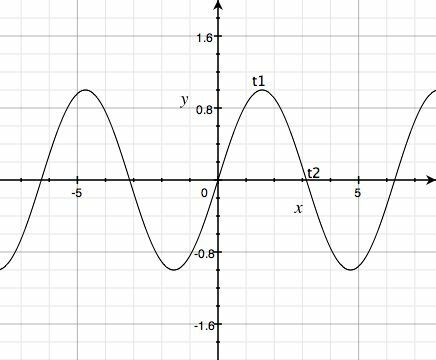 Fourier transforms (which show up in almost everything involving generating or listening to sound using a computer) are based on complex numbers. Dynamical systems are almost always described using complex numbers. Fluid dynamics computations often involve integrations of complex equations. As someone pointed out in another comment in this thread, imaginary numbers get used frequently in quantum mechanics. Many fractals – and thus the applications of fractal math – are based on complex numbers. Some kinds of tomographic imaging systems use complex numbers. One of the most beautiful things I ever saw was a diagram demonstrating Euler’s formulain a textbook on complex analysis from a geometric perspective. It showed the partial sums of the Tayor expansion of eiθ spiraling into the limit. It really made clear why the terms can be broken up into the cosine series for the real part and the sine series for the imaginary part. That same textbook also pointed out and demonstrated that the theory of convergence of Taylor expansions is most sensibly formulated in the complex plane, even if you only want to evaluate the Taylor expansion using real arguments. Doesn’t “cubic” imply a x^3 somewhere? And if so, since the exponent is odd, doesn’t i have to show up bare somewhere in the original equation? Chris, it’s actually pretty easy to force complex numbers to appear when solving a cubic. For example, the equation x3-1=0 has three roots, two of which are imaginary (the third of which is x=1). However, the complex roots of a cubic polynomial always result from a quadratic factor of the polynomial. In the case of the polynomial I gave, what’s going on is that x3-1=(x-1)(x2+x+1), and the second factor has complex roots. The utility of this approach may be limited, but it provides a good way of demonstrating to laypeople that complex numbers really aren’t so weird. Total layperson here but… I still don’t get it at all. Why do you need “i” to plot something in two dimensions? x and y aren’t good enough? What does “i” mean? Why do all equations have have solutions: why can’t they just be denied (i.e. x^2 != -1) if they don’t make sense? Funny, I once heard Peter Sarnak say that p-adic numbers are as real as any other number. Actually, I seem to recall that he may have said that the real numbers are no less unreal than the p-adics. Numbers. . . they all look alike anyway. . .
x and y aren’t good enough because they aren’t *a number*. (x,y) is a point on a graph; (x + yi) can be drawn as a point on a graph, *but it’s a number*. The reason that that’s important isn’t because it means you can plot it on a graph; ordered pairs (x,y) are find for plotting things on a graph. But *numbers* that are intrinsically two-dimensional have very different properties from ordered pairs – and those properties are important and meaningful. Just to give a trivial example: if you’ve got two points, how do you multiply them? There are a few possible different answers. One is to treat them as vectors – and then the result is *outside* the plain where the points lie. Another is to treat them as a polynomial: (a,b)*(c,d) can be treated as (ax + by)(cx + dy) = (acx2 + (bc+ad)xy + bdy2). But again – that’s now something different – instead of being a point in a plane, it’s a messy quadratic equation. But the third is to treat it as a complex: (a + bi)(c + di) starts out the same as the polynomial multiplication, giving you (ac(12) + (bc+ad)(1)(i) + bd(i2). But that simplifies out to (bc+ad-bd) + (bc+ad)i – that is, another complex number. It’s two dimensional, but it’s *closed* under algebra – no algebraic operation will give you a result that is not a complex number. And finally, for “why do all equations have to have solutions?” – they don’t have to: the fact of the matter is that there are some equations that *don’t* have solutions. But with things like the basic polynomials, *they do have solutions*: some equations have meaningful solutions – but those solutions aren’t real numbers. You can say that there’s no solution to x2+1=0 if you want; but you’re just *defining* that it has no solution. The fact will always remain that there *is* a solution to it, a solution that works, and that’s useful for describing real things. There’s a rather simple metaphor that a professor of mine once used. Some people don’t like cats as pets. Suppose that one of them, in an attempt to get rid of cats, changes the definition of the word “pet” so that cats can no longer be called pets. Now nobody has a cat as a pet. But the cats are still there. Redefining the word did nothing but change the definition – it didn’t change the fact. Simple polynomials *do* always have solutions; you can redefine solution so that it means “real number solution” to exclude the complex ones; but they’re still there. Your question has been bothering me too. What is the difference between a 2 dimention vector and an imaginary number? What defines an application in which we should use vectors versus one in which imaginary numbers are better. I mean, we could use vectors to represent alternating voltage in electrical circuits but we don’t, we chose to use imaginary numbers. I know its gotta have something to with euler’s equation as it wouldn’t apply to vectors. I wonder how much harder it would be to do circuits with only vectors. Which operations would be harder to do? The difference between the two-dimensional vector and the complex numbers is in the definition of what they mean – see my answer to plunge wrt multiplication. There are two ways to multiply vectors – dot product, and cross product. Dot product gives you a scalar, not a vector. Cross product gives you a vector – but it’s a vector *outside* the plane where the vectors belong. Complex numbers have two dimensions, and they have well-defined addition and multiplication operators that *are closed* over the complex numbers, and that produce exactly the same results as addition and multiplication for real numbers on complex with a 0i component. Multiplying two vectors and getting a vector outside the plane is just very different from multiplying two complex numbers and always getting a complex. My favorite intuitive description of complex numbers is the one Feynman uses in QED to avoid having to assume the reader understands complex numbers or scare off those who don’t. He defines a times operation on arrows in which you multiply their lengths and add their angles to get the new angle. Of course, if you’re limited to 0 and 180 degree angles, you just get the real numbers. Otherwise, any non-zero arrow must have a non-zero i component. What I like about this explanation is that it is a concrete and visual explanation of a very “real” operation easily understood in terms of geometry. You can also see immediately how the real numbers are not closed and that you necessarily get something off the real number line when trying to find a value whose square is an arrow with a 180 degree angle (negative real) but just sort of conveniently get another real when taking the square root of a nonnegative real. 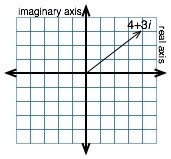 I wish the word “imaginary” could be banned from math pedagogy, as it suggests to students that there is something shady about complex numbers. As the “arrow arithmetic” model shows, complex numbers represent planar rotation and scaling, of which reals are simply a special case of pure scaling, as the roots of unity are a special case of pure rotation. I also wish that C-like languages had had the foresight to make complex an intrinsic type. Too many otherwise sensible people have been led astray into using Fortran for numerical analysis. I hope that this situation will soon be remedied. Question: How did we figure out which one is i and which one is -i? It seems like it would be really easy to get them backwards. * My favorite reason: it’s possible to divide one complex number by another. That sounds pretty innocuous until you find out that there are essentially only four finite-dimensional algebras where that’s possible! I’m glad you brought up Feynman’s “arrows”. Now that I’ve given it a little thought, I find that a number like 3 + 4i makes more sense — is more “real” — to me than a supposedly simple quantity like five hundred thousand. I can get what 3 + 4i means in terms of shifts and turns, but I couldn’t tell you how big a pile of half a million jelly beans will look. Nobody “figured out” which way to put the minus signs. It makes a weird kind of sense: if the only property you have which defines “i” is that the square of it equals -1, then there will have to be two quantities which fit the bill, one of them equal to minus the other. If I work all my problems in terms of what I call i, and you come along and say, “I want to use –i: my imaginary unit is minus your imaginary unit!” then there isn’t a way to judge who chose more wisely. Feynman has a wonderful chapter in his Lectures on Physics entitled “Algebra”. It builds up to Euler’s Theorem — the eiθ relation MarkCC gave above — in a truly beautiful way. I also recommend The Book of Numbers by John Conway and Richard Guy, which gets into the complex kind in chapter 8. For online reading, check out “Trigonometry and Complex Numbers” by J. Baez. “Curious Quaternions” is also nice. To give a concrete example, vectors (but not complex numbers) are used in mechanics to represent velocities, because addition and scalar multiplication (multipying a vector by a real number) make sense in this interpretation but multiplying two velocities together would not make sense, so we don’t need that additional structure. Whereas. . . my mind kind of fritzes trying to come up with a physics example going the other way. . . all I can come up with is the use of a complex number to represent a rotation (by its argument = angle) and a dilation (= stretching or shrinking, by its length); there the product of two complex numbers give the net effect of one such rotation-dilation followed by another. So you would need the additional structure in this case. Sorry that one’s so geometrical but un-physical: it’s too darn hot here for strsightforward thought. I put the equation eiπ + 1 = 0 in needlepoint on plastic canvas when I was in my teens, I liked it so much…. The imaginary numbers also have a geometric interpretation. In geometric algebra (also known as Clifford algebra), there are actually multiple distinct entities which have the property that their square is equal to -1. There is insufficient space here to adequately describe where this comes from, however, there is an excellent article by researchers at Cambridge which does an excellent job of introducing the algebra and the illustrating geometric interpretation of the imaginary numbers. The article is titled Imaginary Numbers are not Real and can be found at the following URL. For those who are interested, I’d say that the first chapter of Tristan Needham’s “Visual Complex Analysis” is absolutely the best, most inspired, most intuitive inspiration of the complex numbers that I’ve seen. I don’t really like complex numbers mainly because it is often very hard to visualize them when they are used to represent a space. For instance I find the idea of complex manifolds to be very unintuitive. Same with complex projective geometry. I just finished being introduced to complex numbers and my text-book completely skipped on real world examples. I’ve now printed out your article to stick it in my notes, thankyou. No, impedance is a load to both parts. Imaginary Z is both capacitive and inductive. If you use the maxwellian formulation of EM, you will see that it is more complex than a separate electric and magnetic field. An inductive load consists of a magnetic field around a coil created by changing current through it. A capacitive load consists of the load for a displacement current between capacitor plates caused by changing potential across. But the displacement current is connected to the magnetic field since it is needed to close the equations for cases involving nonstationary currents. And in the symmetrical formulation for radiation fields the E and M field will be seen as married together nicely into the EM fields. Magnetism is our one daily seen relativistic effect (from moving charges) at low speeds. We are just not used to see it as such. If we are looking at alternating currents, the imaginary power is the reactive part of the complex power. No, but vectors do come in when we stop looking at this simple model and start looking at EM fields instead. The electric field is a scalar field (a value in every point) but the magnetic field is a vector field (a direction and magnitude in every point). And when we can use stuff like poynting vectors that show how EM power flows in the circuit you mentioned. The perhaps most fundamental property of complex numbers outside closure of addition and multiplication, already mentioned, is analyticity: a function on complex numbers is often analytic, which mean that derivatives of all order exists, which in turn also are analytic functions. This makes most everything easier to do in complex analysis than in real analysis, especially integration. Duh! I was thinking about the radiative EM formulation where one have two such fields. In the maxwellian formulation both fields are vector of course! You appear to denigrate the idea that complex numbers could be seen as ordered pairs, but I’m sure I’ve seen at least one explanation of complex numbers that treat them as exactly that – that is, that treat the set of complex numbers as the set of ordered pairs of real numbers, augmented with particular rules for addition and multiplication; so that the complex number a + bi is the ordered pair of real numbers (a,b). The “addition” is defined componentwise, so that (a,b)+(c,d)=(a+c,b+d), and the “multiplication” is defined so that (a,b)*(c,d)=(ac-bd,ad+bc). After all, the set of complex numbers is closely related to the real plane, as you obviously appreciate. That is what my first post was about. There’s no real distinction between the two possible square roots of -1; If there exists one of them, then according to the rules we use, there must be another one, its negative, and it has the same properties as the original. They’re not different like 1 and -1 are. We chose one arbitrarily and call it i, so the other one is -i. But “choosing the other one” as i doesn’t matter in the slightest – assuming you don’t swap them aroud halfway through whatever you’re doing, of course. While my post from last night waits in the spam queue (I included two URLs for reference), I’ll throw in another. One such presentation of complex numbers — as ordered pairs with special multiplication rules — is William Rudin’s Principles of Mathematical Analysis. We used this book in my one and only analysis class, which may explain why I remember so little of the analysis I “learned”. It’s a much better book for looking things up after you’ve already seen them than it is for studying things the first time! If my memory is not too fallible, Rudin does it that way specifically to avoid the confusion about choosing which i you want to call i. The point I was trying to make was that as we generally understand them, ordered pairs are *pairs*. That is, they’re a set of two different numbers. A complex number is *not* a pair of numbers; it’s a single number with two components. It’s a difference in how we generally understand the concepts. As far as *representation* goes, an ordered pair is a fine representation for a complex number; it’s just important to make the distinction between the *representation* of the complex number as a pair of reals, and the *reality* of the complex number as a single, atomic number in two dimensions. …a function on complex numbers is often analytic, which mean that derivatives of all order exists, which in turn also are analytic functions. Let me point out that complex numbers are especially nice in this regard. If a complex function is differentiable, it is also infinitely differentiable and analytic (analytic = representable by power series, not just infinitely differentiable). On the other hand, there exist real functions that are differentiable but not infinitely differentiable, and real fuinctions that are infinitely differentiable but not analytic. Add them and you have to associate them with a real number (eg, i + i = 2i). You cannot have an “imaginay” quantity of “imaginary” things, else they become “negative real numbers” (eg: i x 2i = -2). Of course there are quaternoins, and so on, but these are non-commutative. analytic = representable by power series, not just infinitely differentiable. Thanks for the correction! I didn’t have my complex analysis book handy, and I felt I left something out. f(x)=e(-1/x2) for x not 0, f(0)=0. Homework: check that all derivatives of f(x) exist at 0, and are equal to 0 there. In particular, this implies that the Taylor series of f(x) centered at x=0 is identically 0. Thus f(x) is infinitely differentiable at x=0, but not analytic there. On the other hand, this function is not differentiable at 0 as a function on the complex numbers. You know the usual; it has been a long time. The difference in definitions is due to wikipedia discussing both real and complex analytic functions, while mathworld, BETA (and my course book) and I are discussing complex analyticity. I will try to remember your more general definition, it is of course better. While I agree that complex numbers are frequently useful in physics, I’ve often wondered if they are necessary. In other words, couldn’t a group of Martians, who avoid complex numbers for theological reasons, could still solve all the problems of electrical circuits just by considering voltage and impedance to be two (real) cycles out of phase with each other. Are there any physical problems that require complex numbers? The only candidate I can think of is quantum mechanics, and even there I’m not sure that the Martians would be out of luck. What I really want to know is, does nature really use complex numbers? Or are they just a convenient shortcut for us to make solving the equations easier? Yes, complex numbers are really necessarily. You need to forget the idea that there’s something “imaginary” about them. A complex number *is* just a pair of “out-of-phase” real numbers with a peculiar multiplication operation on those pairs. They’re not two disconnected real numbers: when you do a multiplication, you get a transfer effect between the two sides of the pair: the “real” component affects the “imaginary” component, and vice versa. To make the equations of electrical physics work, you need *both* the pairing of the two numbers, *and* the multiplication behavior. So if you somehow removed complex numbers, you’d basically just be rewriting all of the equations to *recreate* the complex numbers and their multiplication operation. i need more explanation on how you got x.
should Y= x^2+9 look different if it were graphed on the complex plane? What would it look like at 3i and -3i…and if there is no order in imaginary numbers, is it possible to graph an equation like y=x ? Should Y= x^2+9 look different if it were graphed on the complex plane? What would it look like at 3i and -3i…and if there is no order in imaginary numbers,how does one proceed to graph it?